While Summer’s warm and welcoming breeze may be just about ready to dissipate, Nike wants you to lace your kids up in a picnic-ready set of Nike Sportswear selections while you still have the chance. 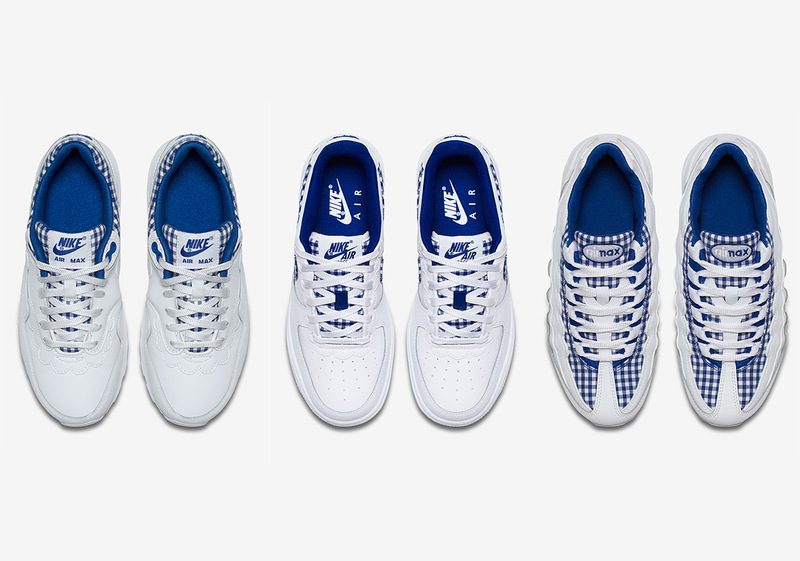 Utilizing a clean and concise Indigo Force and White color scheme, Nike dresses the Air Max 1, the Air Force 1, and the Air Max 95 up with gingham textile elements and scalloped edges for an intriguing feminine twist. Dubbed the “Gingham” pack, these three Beaverton Brand classics feature picnic-blanket-styled designs in different key areas, the likes of the throat of the AM1 and the AM95, and the midfoot Swoosh of the AF1 to give each shoe a bit of its own flavor. Its scalloped edging detail provides an aesthetic similar to that of a doily that one might find decorating an end table or as a coaster underneath an ice cold and refreshing glass of lemonade. Official images of these perfect NSW selections for the end of Summer are available below, while pairs can be had from Nike.com today for either $90 or $120 USD.